With its many systems of rivers and lakes, Northern Ontario is simply bursting with fish, including some of the world’s most desired game. For those seeking the fishing trip of a lifetime, there are plenty of outfitters ready to help navigate the waters. Some of these outfitting services include fly-in, full-service lodges. Guests only need to bring gear, clothes and the drive to fish! Lakes at these lodges are usually only able to be reached by floatplane. Packages typically include all meals and upscale accommodation, perfect for those looking to treat themselves. 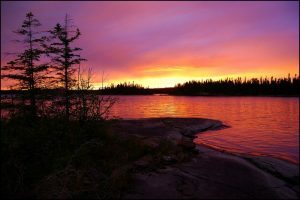 Other lodges in Northern Ontario provide a more independent experience. Fly-in outpost camps are perfect for the angler who likes to be self-sufficient. Meals are made using the kitchens in fully equipped cabins. At most remote camps, cabins like these are the only ones lakeside, meaning a quiet experience where the only other living creatures around might be the fish. Outpost cabins these days are usually outfitted with hot water, electricity, full bathrooms and more. For anglers who like the full experience of fending for themselves, other outfitters will simply drop guests off along the water with a canoe, gear and food. Head downstream and drop a line for days at an end, resulting in a tranquil, solitary trip. Many full-service camps and lodges are drive-in — no floatplane necessary! Bring your own boat or rent and hit the water to angle for prized species. With so many pristine bodies of water, it’s not difficult to find quality fishing without having to fly. For trips as short as a day, head out on a chartered downrigging trip in the Great Lakes. Guides can assist maximize the experience for hours or days, advising on spin-casting and other fly-fishing nuances. The most populous species include walleye, pike and bass, but trout, like lake, brook, rainbow and steelhead are also popular. Salmon (Chinook, coho and pink) are also plentiful. And some say that there is a world record Muskie waiting to be caught in Ontario’s waters! 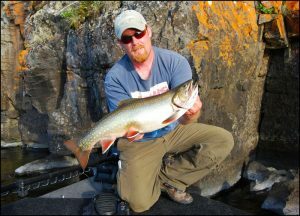 Simply put, there are more fishing opportunities in Northern Ontario than anyone could experience in their life. A hearty breakfast fills you up before you set out on the water to reel in walleye. Lunchtime rolls around, and you’re relaxing on the shores with your guide, ready to enjoy the fruits of your labour as your catch is cooked to perfect. You relish the warmth of the sunshine before venturing through thick weeds for pike. Out of the corner of the eye, you spot an eagle overhead and a moose on the opposite shore. Later on, you feel a tug on your line, and you come out victorious, hauling in a trophy pike. As you come back to shore, the smell of perfectly cooked steak lures you to the lodge. After swapping stories with other guests, you decide to head to the games room while others go back out for an evening round on the water. With many more days to go, you can’t wait to set out again in the morning for another long day of fishing. Use the resources below to help you plan the perfect trip to the best fishing resort! Check out our lodge directory for the best fishing lodges in Ontario. Fill in our form and get information from some of the best resorts for fishing in Ontario. Great articles and tips to make your next fishing trip the best one EVER!